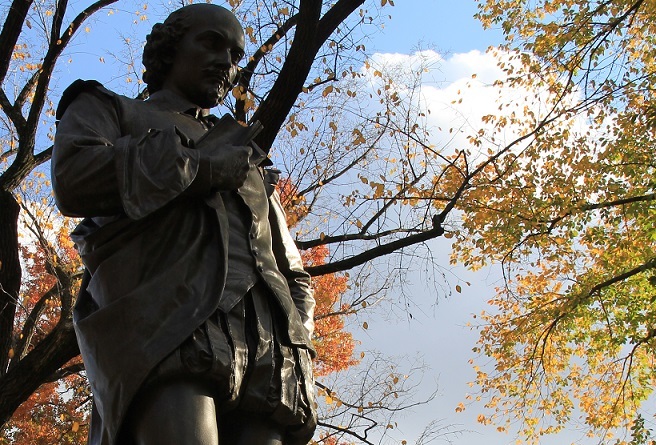 bar none group: What Do We Know About Shakespeare? A flash essay by Charles Bane Jr. I once sat beside a dinner guest, an attorney, who, hearing that I was a poet, spent the evening explaining carefully why Shakespeare was a lawyer, who happened to write plays and sonnets. This is a tribute to Shakespeare, who inhabited every soul's shoes, but it also underlines the profound difference between our times and the Bard's, when everyone had a general knowledge of law — for their safety's sake — and it further adds to our understanding that Shakespeare — very unlike most his fellow actors — and unlike poets even today, was a businessman determined to prosper, even while giving reign to his genius. Visit the Mermaid Tavern, in Shakespeare's day, where he went often to meet good cheer. It was a raucous, easy place of alcohol and loud wits. But a businessman — always with an eye out for the main chance — would have noticed the Mermaid's steady traffic. Sure enough, its owners' name became attached to Shakespeare's on a title. Shakespeare lived a conservative life of business in direct counterpoint to his station as an actor in Elizabethan England. He kept careful accounts. He purchased property, on mortgage, that were strictly repaid. This is of a piece with his deliberate steps to London; a youth making his way to the great town with a vague ambition of finding success would have been stopped and jailed at the first village he entered. Shakespeare was compelled by an expressive genius that has never been bettered, and a dread of poverty. "Dragoon", Dylan Thomas said to his sister Nancy when they were small, "isn't that a wonderful word?" And that word multiplied beneath the painted roofs of early theaters and at last, the Wooden O, into a language equal to the world. But in the end, we do not know Shakespeare personally, because, I believe, it was his choice. the bird of dawning singeth all night long." Some say. For Shakespeare, humanity was his sourcebook and his curtain, and he stepped into public view only to apply — meticulously — for a coat of arms. He was determined to die a respectable man. And while I revere his work, I also honor his request for privacy. Charles Bane, Jr. is the author of The Chapbook (Curbside Splendor, 2011) and Love Poems (Kelsay Books, 2014). His work was described in the Huffington Post as "not only standing on the shoulders of giants, but shrinking them." Creator of the Meaning of Poetry series for The Gutenberg Project, he is a current nominee as Poet Laureate of Florida and working on a new collection, The Ends Of The Earth. What Do We Know About Shakespeare? appears here with the author's permission. Labels: Charles Bane Jr., essay, flash essay, Shakespeare, What Do We Know About Shakespeare?